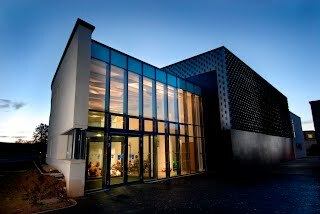 Seeing Sound is based at Bath Spa University’s Newton Park campus, primarily in the Michael Tippett Centre, our new Commons building, and the University Theatre building (pictured). This year we are able to offer University accommodation, with en-suite rooms of various types (price range £60 – £75), both on our Newton Park Campus and in Central Bath. This can be booked on the Registration page, and more details can be found there. We think this option is well worth considering – rooms in Bath can be pricey, and being on-site could be advantageous, making everything for the whole weekend accessible on foot.